Trainer Peter Snowden has declared Everest champ Redzel ready to begin his defence of Australia’s richest race following a rousing trial at Rosehill on Monday. With his trademark blinkers applied, Redzel led throughout in the 1000m gallop that also contained Everest favourite Trapeze Artist and another Everest runner in English. The six-year-old is set to resume in the Group 3 Concorde Stakes (1000m) at Randwick on Saturday week, a race he won last year on his way to conquering The Everest. “We asked him for a bit today and he quickened nicely so he’s on track,’’ Snowden said. “He switches right on when he’s got the blinkers on him and his whole demeanour this time in has been very good. Redzel stopped the clock in 59.70 and ran his last 600m in 34.10 as he edged away late under a good hold from Kerrin McEvoy to win by over two lengths from Champagne Cuddles and I Am Excited. 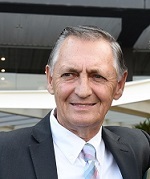 Just behind the placings in fourth was TAB’s $4.50 Everest favourite Trapeze Artist and both trainer Gerald Ryan and jockey Tye Angland are rapt with his progress given he’s still almost three weeks away from a resumption. The entire, who beat Redzel in the TJ Smith Stakes in the autumn, trialled without his blinkers which is the norm for the horse. “He had a good hit out last week and has come on from it and I thought he trialled lovely,’’ Ryan said. Trapeze Artist is clearly feeling well as he did plenty of propping, reared once or twice and bounced around once Angland jumped on board to take him to the gates. It was the jockey’s first sit on the horse since the All Aged Stakes win back in April and he said all the signs are positive. “When they go out and are pig-rooting they’re obviously very fresh and he felt great,’’ he said. The Group 2 Theo Marks Stakes (1300m) at Rosehill on September 8 will begin Trapeze Artist’s path to the $13 million The Everest (1200m) on October 13. A couple of lengths behind Trapeze Artist in the trial, and given an easy first public hit-out, was the Gai Waterhouse and Adrian Bott-trained English. Jockey James McDonald said it was an ideal kick off to her preparation and she’ll take improvement from it. “She travelled well, she wasn’t out to do too much but I was really happy with her,’’ McDonald said. English, who ran sixth in The Everest last year, is due to return in the Group 2 The Shorts (1100m) at Randwick on September 15. Two more Everest runners - the Anthony Freedman-trained Shoals and Santa Ana Lane - are due to trial at Cranbourne on Tuesday morning.